Thread: Best $10 I ever spent! 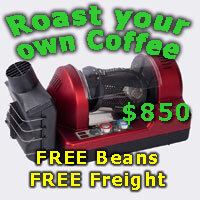 A few weeks ago I was browsing the 2nd hand coffee machines on Trade Me (online auction site) here in NZ. I spotted a La Pavoni 'Espresso Cappuccino' listed at $10. Worth a look I thought. The listing stated that it seemed to power up ok but there was no flow. Still it looked in reasonable nick and I thought it'd be worth it just for the parts. I put a lazy $15 high bid on, but to my surprise ended up winning it for $10. Especially surprising as one exactly the same sold the day before in another part of NZ for $305!! As you can see I pulled the panarello outer off as, to be honest it was crap. Using the plastic steam arm with just a single hole in the end was a little difficult due to its short length but it was doable. The best news was that I got flow through the group and PF straight away. The PF is a pressurised 'locking' one (basically the same as the Saeco VV one) and I think maybe the seller wasn't aware of how to use the PF properly. She was just selling off some of her Dad's old stuff after his passing so wasn't really interested. I might do a proper descale at some stage, but I'm not sure it's warranted yet and I'd hate to cause problems for no reason. The only thing I think I definitely want to do now is put in a new brew thermostat. I haven't measured brew temps properly, but holding a milk thermometer under flow from the group head only gives a reading of about 60degC. Even using this very unscientific method I reckon I should be getting at least 70-80degC. Anyway, still made a very drinkable latte this morning which is all I need while I'm still working on both my Simona Top and Gaggia Classic. aussieflicker and mulquemi like this. Generally, (and I'm not a coffee machine tech), measuring the temp the way you have is very inaccurate. It can only be done using the proper tool, which approximates the flow characteristics of a full basket of coffee, and is instant reading. If the coffee is fine, the temperature probably is too. Great find,how smug you must feel ,finding such a gem,good luck. Image three ,is it worth considering shortening the internal copper piping to better accommodate the modified steam wand ,or would the vertical protruding swivel cause more difficulties then it's worth? I've recently modified a Gaggia classic , retro fitted with a Rancilio steam wand,looks much neater and the water tank now clears the wand,as it should. All over good job,achieving your transformation , almost as satisfying as the coffee itself! I do try not to be smug, let's just say I was very pleasantly surprised and happy that it's worked out. Initially I wanted to place the Brugnetti steam wand higher up and I looked for an adapter or two that would've had the small orange plastic collar you can see sitting just below the hole in the case and the fitting above it sitting just inside the case positioned vertically. This would've been possible with the the use of either one or two adapters depending on their size, but the problem I struck was that I had to remove the pipe fitting from the steam valve altogether to make room and therefore needed the first female adapter to screw straight onto the male thread on the steam valve. All sounds fine except that this male thread on the steam valve is a very unusual 14x1 metric thread. I guess it's not unusual it's just hard to find fluid adapters in this size. I'm sure they're out there, but no one here in my part of NZ stocks them. The other option would've been to cut the elbow you can see off the bottom of the pipe fitting, but I decided not to do this as it would've irreversibly modified the machine. At least with what I've done any future owner can just screw the Brugnetti wand off and replace it with the original panarello or cappucciniore. I absolutely agree that there's no way I can get an accurate reading this way, but I should still be seeing a higher reading than 60deg. The other reason I know it's brew temp is too low is simply taste and temperature in the mouth. I had a sip of the 'espresso' this morning straight after extraction. Eeew. It's bordering on cold so I've got a new thermostat on the way.